Ok boy mamas, let's chat, shall we? There is much chatter that being a mom to a male offspring is not nearly as fun in the wardrobe department as it might be if we had birthed a bitty girl mini. True, we might not be able to coordinate our bikinis with our littles (or can we? ), but there is a wild world of boy attire out there that deserves to be bragged about. Case in point, G's little fishing shirt that spurred quite a few boy mamas to reach out to me for all of the info after yesterday's puppy + baby romp in the vineyard. I work hard to make sure that my kid is relatively put together, comfy, protected from the elements and not naked in public. Bold goals, I know, but what can I say? I'm obviously an over achiever. Thank all the things for companies like Prodoh who handle the heavy lifting and allow me to only concern myself with things like buttons and rolling a sleeve or two. We (and by we, I actually mean my husband who made a mad dash for baby sized fishing shirts like they were handing out the last steak on earth) first spotted Prodoh gear in a local children's boutique here in Greenville. Obviously, on the one day that my husband was ready to throw down some moolah on baby clothes, the shop was out of G's size. Being the super mommy that I am, I set out to find a teensy little fishing shirt to make the men in my life happy campers. I had no idea that the Prodoh families are based here in Greenville and run their company in our new neighborhood but, lucky for them, I live right around the corner and knew I had to bug them about all things boy garb. By now we all know that I love a small shop and a maker finding success doing what they love, but clearly the Prodoh gang also has a sense of humor. Check out their employee bios - gotta love a sassy roll call. 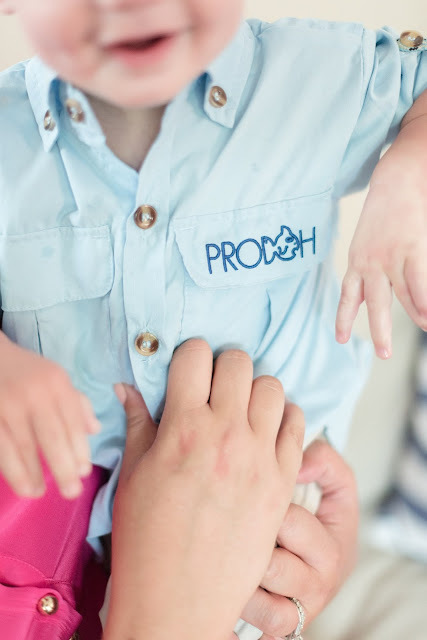 Side note: I honestly don't think that I can remember hearing a sweeter story of a business plan hatching than that of Prodoh - one of the Prodoh babes just needed to have a shirt just like their Daddy and, because all Dads are secretly softies, a business was born. As luck would have it, the fabulous Christa Rene Photography was snapping some shots of me for my Facebook page and happened to catch my babe waking up from his nap and sans clothes (I tend to avoid dressing him when he's cranky/just before a nap thanks to his crazy alligator roll changing pad shenanigans). Thankfully, I can button him into his Prodoh shirt while he palms a bottle one handed, minimizing the screams endured by all and ensuring that we can leave the house in something more than a diaper. 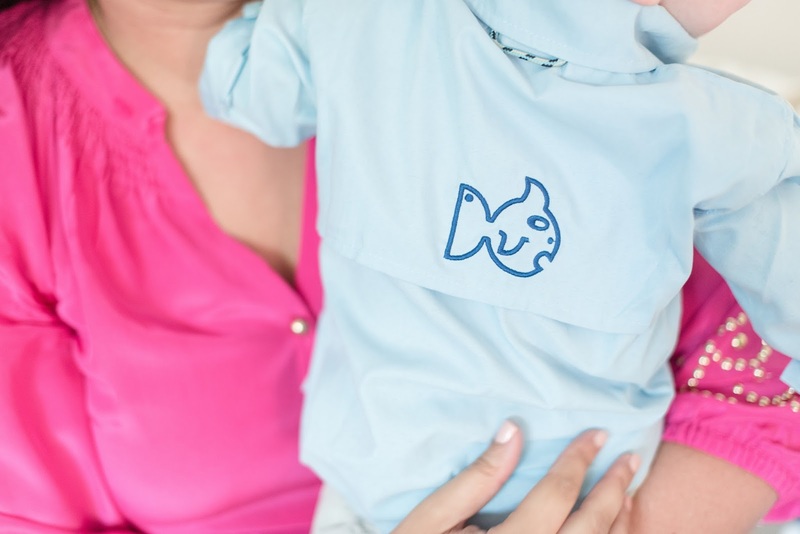 So, because two dads were clearly behind some of the design elements, you'll find a cute little feature on each shirt, perfect for baby boy parents. See that little loop peeking out of G's collar? It's called "the get back here loop"! Perfect for a babe on the run. Oh, and get this, the shirt is rated with a UPF 50, the highest level of sunprotectant of any fabric. Bless it, because my babe did not hit the Punnett Square jackpot and land his mama's olive tone. I die for the pink gingham. Die. 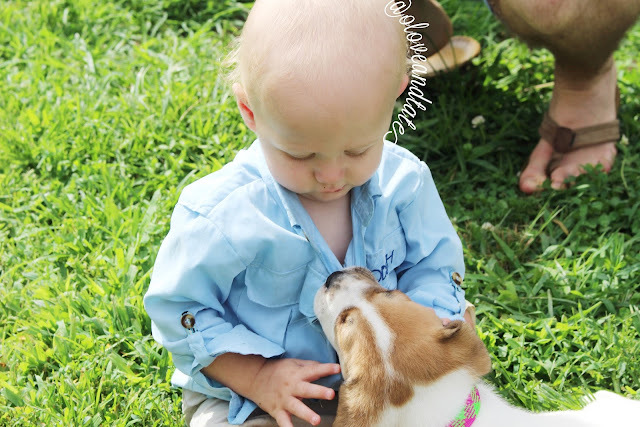 Many thanks to Prodoh for stocking G's wardrobe with the cutest shirts and shorts - aaaaaand we hope you don't mind that we let a puppy eat one of our shirts. I want to eat him up!! I know an olive girl he can marry... Olive skin and blue eyed babies could be our future!